Rega launches Elicit-R amp and Aria phono stage | What Hi-Fi? Rega has confirmed details of two new products for summer 2013, the Elicit-R integrated amplifier and the Aria MM/MC phono stage. The Elicit-R sports a new look, custom-designed case and boasts upgraded circuitry based around the excellent Brio-R amp. Also new, and shipped with the Elicit-R, is Rega's Solaris system remote handset, which can control this amplifier and all the Rega R Series electronics. The Elicit-R delivers 105 watts per channel into 8 ohms, has five line inputs, with one input also able to act as an MM phono stage with the flick of a switch. If you don't want to use this phono stage, this set of inputs is also ideally suited for connecting more sensitive products, such as an external phono stage. There is also a tape loop, a direct input, a preamp out, and a single set of speaker terminals. The Rega Elicit-R comes in a black satin metal finish and is on sale now for £1498. Look out for our review in the not too distant future. 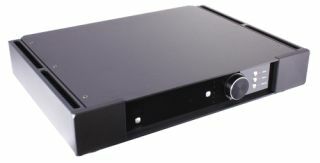 Also new from Rega is the Aria MM/MC phono amp. In the now familiar half-width case, the box houses dedicated MM and MC phono stages. Offering a single set of RCA phono outputs alongside separate analogue inputs (and bespoke circuitry) for the two phono stages, the Aria is an "all analogue" amplifier with no digital circuitry. The MC stage allows you to change the input sensitivity by 6dB via the back panel, while the MM stage sports individual power supplies for each channel for maximum efficiency. Available in a black finish, the Rega Aria MM/MC phono stage is on sale now for £798.